As the risk of higher interest rates continue to abate and limited options remain for investors seeking companies not dependent on a strong economy for growth, attention has increasingly turned to biotech as one viable alternative. Despite respectable returns in January and February, the sector continued its advance in March, buoyed as this realization set in. Allocation to biotech was further amplified by the hysteria around the inversion of the US yield curve, signalling too-tight monetary policy in the last bastion of growth in an anemic growth world. This phenomenon was quantified in a recent Raymond James report3 on March 26th highlighting the propensity of biotech to outperform the market from the point of yield curve inversion. The study was further corroborated by a Bernstein report4 highlighting that healthcare had delivered positive returns six months and 12 months in each of the past five curve inversions dating back to November 1980. While every recession has been preceded by an inversion, not every inversion has led to a recession. The inversions in 1989 and 1998 led to explosive forward returns for biotech, even as other sectors floundered. For March, the Next Edge Bio-Tech Plus Fund (the “Fund”) Class A Units advanced +3.05% and the Class F Units +3.15% versus +0.32% for the Fund’s Benchmark. 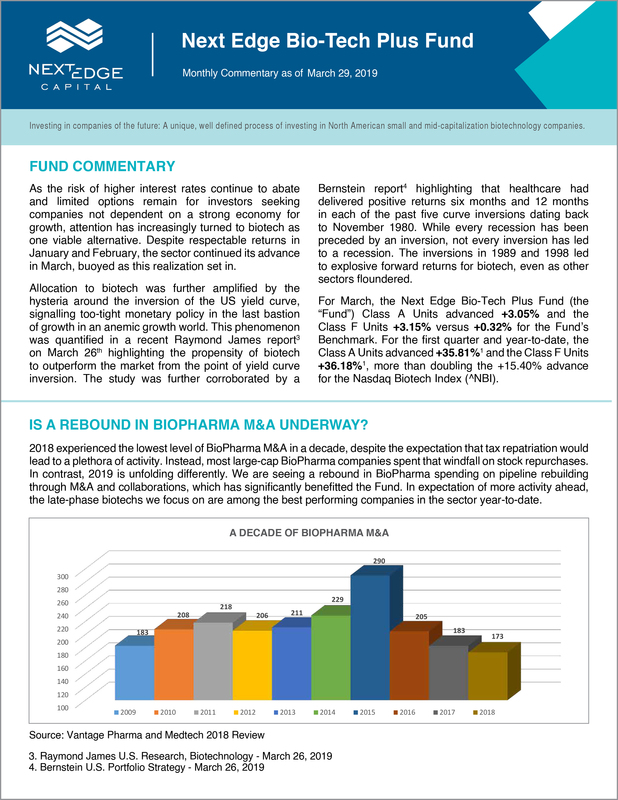 For the first quarter and year-to-date, the Class A Units advanced +35.81%1 and the Class F Units +36.18%1, more than doubling the +15.40% advance for the Nasdaq Biotech Index (^NBI). IS A REBOUND IN BIOPHARMA M&A UNDERWAY? 2018 experienced the lowest level of BioPharma M&A in a decade, despite the expectation that tax repatriation would lead to a plethora of activity. Instead, most large-cap BioPharma companies spent that windfall on stock repurchases. In contrast, 2019 is unfolding differently. We are seeing a rebound in BioPharma spending on pipeline rebuilding through M&A and collaborations, which has significantly benefitted the Fund. In expectation of more activity ahead, the late-phase biotechs we focus on are among the best performing companies in the sector year-to-date. The percent of the +200 companies in the Nasdaq Biotech Index (^NBI) trading above their 200-day moving average declined to 8% in late December from 60% in August. The Nasdaq Biotech Index (^NBI) typically makes multi-year bear market lows when this reading dips below 10%, as it did in 2002, 2008 and 2016. Each episode as followed by years of positive returns. Historically, this measure achieves a reading of 80% to 90% before a new advance rests. For 29 months between July 2016 and October 2018, this indicator oscillated between 40% at the bottom of the range and 65% to 70% at the top of the range. Despite the 2019 rally, this reading has moved up only to the bottom or oversold reading of the past 2.5 years. This suggests there is plenty of room for the rally to stair-step upward in the months ahead before any semblance of an overbought reading is achieved. The increase in cash holdings in February to 12% was attributable to monetizing the two holdings that received takeover offers, Spark Therapeutics Inc. (ONCE) and Clementia Pharmaceuticals Inc. (CMTA), and was redeployed in March, adding to existing positions and initiating three new positions. As a result, cash decreased to 7%. The increase in the weight of Canadian Holdings from 49% to 53% is due to financing new Fund investments. US positions increased from 39% to 40% due to appreciation. ** Part Month start date: February 17, 2015 to Feb 27, 2015. There are inherent limitations in any comparison between a managed portfolio and a passive index. Each index is unmanaged and does not incur management fees, transaction costs or other expenses associated with a private fund. There are risks inherent in hedge fund investing programs.